2013 marks Superman's 75th Anniversary. Man of Steel, the latest attempt to reboot the Superman franchise, is a hit-and-miss affair. Certainly the film treats the material as a grand spectacle, sometimes overwhelming one with the largeness of it all. How one feels about Man of Steel may depend on how one feels about the film twisting the Superman mythos to where it goes against decades of established lore. Those who love big and loud will be thrilled. Those who aren't impressed with big and loud and ask for story and acting to carry a film as much as special effects may register slight disappointment. We go back to Krypton, which has a lot going on at the same time. The planet is about to explode due to its wanton and reckless use of its core for energy. With the world literally falling apart it seems like the worst time for a coup attempt, but that doesn't dissuade General Zod (Michael Shannon) from attempting a putsch. His friend, Jor-El (Russell Crowe) attempts to talk his old friend out of this, but nothing doing. He will restore Krypton or at least the genetically-engineered Kryptonians (he will decide who has the pure blood, with lesser Kryptonians not faring well). This might trouble Jor-El, because his wife Lara (Ayelet Surer) has given birth to the first naturally-conceived and born Kryptonian in many centuries. In order to protect future Kryptonians, Jor-El steals the Codex (this skull-like thing that keeps all Kryptonian children...I think) and puts it with a ship that spirits his newborn son into outer space, destination Earth. The coup attempt flops, and Zod with his minions, including Faora-Ul (Antje Traeu) are imprisoned in the Phantom Zone. However, there is no joy in Krypton, with Jor-El dead at Zod's hands and Krypton about to die. We skip the infant's early years and go straight to Clark Kent (Henry Cavill) working aboard a fishing ship. Here, he saves an exploding oil rig, but as soon as his job is done, he disappears. In fact, Clark is now a drifter, going from job to job, knowing of his powers but unwilling to reveal himself. In flashbacks, we see how he came to be this way: his adoptive father Jonathan (Kevin Costner) constantly urges his son to keep his powers secret, while his mother Martha (Diane Lane) does her best to protect him from the troubles of being a child unsure of himself. Up in the cold Canadian north, a strange ship is discovered. The ship, protected by military man Colonel Nathan Hardy (Christopher Meloni) and studied by scientist Emil Hamilton (Richard Schiff) are intrigued by it, but don't know much about it.Enter Lois Lane (Amy Adams), reporter for the Daily Planet. Also up there is none other than Clark Kent (under yet another assumed name) who goes there and finds the truth about his past from the ghost of Jor-El. Lois also finds this ship and Clark rescues her. Lois writes about the ship and her rescuer, but Daily Planet editor Perry White (Laurence Fishburne) wants nothing to do with aliens. Despite her Pulitzer, Lois is rejected, and goes to an Internet site manager she dislikes to leak the story. The mechanism that Clark used to open the ship's memory also attracted the attention of a released General Zod, who tracks it to Earth and does go on television to tell the humans, "You Are Not Alone". He also tells them of Kal-El, the last son of Krypton, and demands that they turn him over or face the Wrath of Zod. By this time Lois Lane has already discovered Clark Kent's secret, and after some thought he decides to give himself up. Zod has plans for Kal-El: he will remake Earth into Krypton's own image, which of course means wiping out the native population. Kal-El, torn between his home world and his adopted world, decides he cannot go along with this. With Lane's help (who in turn gets help from Jor-El), they thwart the General's first try, but Zod will not be denied. Zod sends down machines brought from lost Krypton colonies and is beginning to destroy Earth. Major battles in both Metropolis and Smallville go on, and in the end, the newly-dubbed "Superman" defeats Zod, falls for Lois, and decides he needs a job...one where he can keep track of things. How 'bout a reporter at a major newspaper? All he needs is a pair of glasses. I am not too surprised that director Zack Snyder or screenwriter David Goyer (from a story by Goyer and Christopher Nolan) wanted to tweak the Superman origins story in order to make the familiar new again. However, there were things in Man of Steel that in retrospect, don't make any sense. Chief among them is the relationship between Lois and Clark/Superman. I'm not a purist who insists everything must stand according to established Canon, but I do wonder why Nolan, Goyer, and Snyder decided to restructure the origins to where Lois knows before Clark arrives in Metropolis that he and Superman are one and the same. There is something shocking, almost galling, to hear her go up to a fully-dressed Superman and call him "Clark". Another matter I didn't understand was why the government feared Superman at the end of the film. He saves the world, and they still don't trust him? It begs the question, what exactly does Superman have to do to convince them he fights for 'truth, justice, and the American way'? Why would Zod lead a coup when the planet is about to explode? It does seem rather a waste of his time? It also seems an even bigger waste of Krypton's time locking him up and sending him and his crew out into space when they are all about to die. Wouldn't it have made more sense for THEM to get on that ship and leave Zod and Company on the doomed Krypton? One more thing that was of concern was the open-ended nature of the film. No, I'm not surprised Man of Steel suggests there will be a sequel (that's almost a given, especially when we get a quick shot of an oil truck owned by LexCorp). What IS surprising is that it ends with Clark Kent going to Metropolis to work at the Daily Planet. Given that Lois already knows Clark's secret identity, what fun will there be in her finding it out? I had expressed concerns about Zack Snyder directing Man of Steel, and I have found my fears confirmed. Snyder is a director much more interested in the visuals, in how the film zips and zooms across the screen than about the story itself. Here, one can see his penchant for the look of the film drawing attention to itself almost from the get-go. There were constant zooms that weren't needed when Jor-El rides some sort of flying dragon across Krypton. Certainly, some scenes were quite impressive (the recreation of Krypton's history with Jor-El's ghost guiding Kal-El's lesson was well-made, though a bit odd in my view), but the non-linear story (jumping between the present and Clark Kent's troubled past from elementary school to Jonathan's death) made things sometimes seem flat-out weird. For example, when Zod takes Superman to his ship Kal-El is drugged. Here, he either slips into a bizarre dream sequence where Zod tells him his plans for New Krypton or Clark Kent is actually remembering when Zod stopped by the Kent family farm to show him all this, with this sequence ending with Superman drowning in a sea of human skulls. Therefore, it must be a fantasy, but given that we jump a lot through time in Man of Steel, and given that sometimes it looks like The Tree of Life: DC Edition, it was a bit peculiar to say the least. The casting of Henry Cavill as Kal-El, Last Son of Krypton, was highly controversial. Granted, casting such an iconic character was fraught with dangers, but somehow, the idea of an ENGLISHMAN (!) playing one of the most iconic AMERICAN heroes bordered on blasphemy to many devotees. 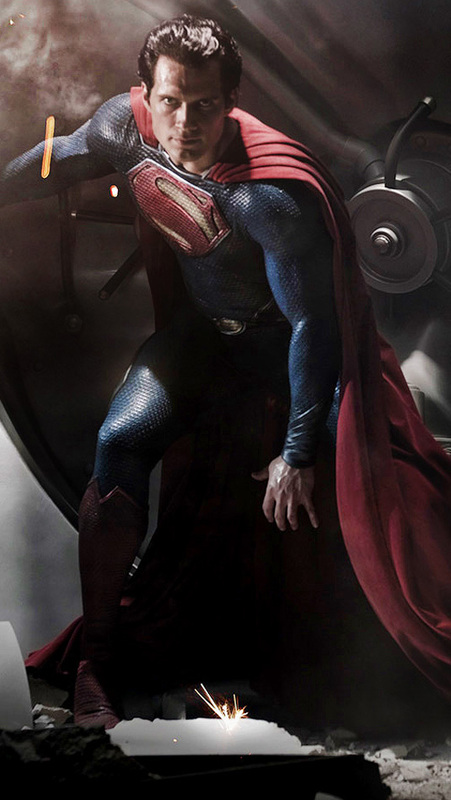 Now that we've seen him in action, I think that Cavill is an extremely beautiful-looking man who is perfect when he stands still. However, his performance is perhaps the weakest of all the ones in Man of Steel. He certainly is the weakest actor to ever play Superman. Weak not physically perhaps (the film goes to great lengths to feature Cavill's physique) but weak in terms of actual acting. There is hardly a hint of emotion in any of his scenes. I found his Superman to be so passive as to be inactive. There is no sense of wonder at finding a member of his own people, or of worry about his secret being discovered by Lois Lane. In fact, during the climatic battle(s) that dominate the last third of Man of Steel, he didn't register anything. He might just as well not have shown up for the flatness of Cavill's blank stares. This is especially sad given that Clark Kent has so much angst to him. I won't use the popular term for Man of Steel's main character (brooding), but he certainly is not a mild-mannered reporter. Instead, this Clark is one driven by self-doubt, by a conflicted idea of having great powers but not being able to form long-lasting relationships (a bit like the Incredible Hulk, only not filled with rage). The other performances around Cavill were much better. Chief among them is Michael Shannon as Zod. He played the character as a true menace throughout Man of Steel, both as he attempts to overthrow the Krypton Council and when he has his genocidal plans for humanity. Costner and Lane work wonderfully as Clark's adoptive parents, the former quietly offering his words of wisdom and caution against using his powers for fear of being taken, the latter with the quiet nurturing and loving of a mother. Crowe did a similarly good job as Jor-El, though having his ghost there made him more an Obi-Wan type than a true father to the last son of Krypton. Yet the sadness of seeing his only child have to leave or his desperation to get Zod to stop his madness elevates the performance. Good, not great. I like Amy Adams, and think she is one of the best actresses around. I would say she does a good job as Lois Lane, though there isn't much to her: no humor, nothing especially special about her that will make her the love of Superman's life. Fishburne gets kind of lost in the shuffle as White, though in his defense he did start out as the tough newspaper editor and only later with all the explosions and disasters going on around him was he reduced to almost nothing. Let me address that for a moment. Snyder and company decided to do major destruction to the world (and apparently, the IHOP in Smallville), and in this we get two bad things. One, the film begins to become overwhelmed with it all: making the obliteration of Metropolis and Smallville even bigger and more disastrous than perhaps it would be. Two, the 9/11 allusions (the rubble, the rescuing of people we never get to know from the rubble, the ash-covered faces) even after ten years, is still a bit disturbing. I think this is why, for me, Man of Steel is less than the sum of its parts. We just never get to know the characters. We don't get to know Clark or Superman, just this hybrid of a person. We certainly never know Lois Lane all that well (Perry White even less so). The woman White rescued from the rubble? Why should we care if we don't even know her name? I'm sure they gave it but I never learned it. I don't think in fairness I can call Man of Steel a failure. Perhaps not a failure but a very weak success. A very boring movie, especially coming on the 75th anniversary. Weak casting, scripting and special effects.